The Strategy analyzer saves a log on each backtest. The logs can be seen by right clicking on the Strategy Analyzer and selecting "Show Logs". Logs offer a convenient way to keep a history of backtest results. They can be used as you work to develop a strategy and fine tune parameters and code to compare previous backtests to current backtests easily. The log also contains a saved snapshot version of the code used for the backtest, making it possible to look at or revert to previous code used. 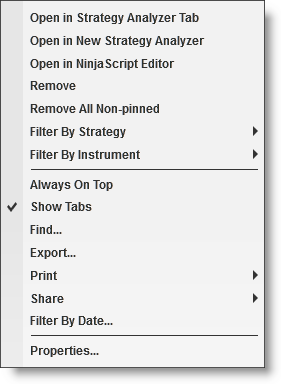 Note: Code save functionality only works on open and unlocked NinjaScript Strategies. Strategies which are protected by the vendor cannot be used to save code. 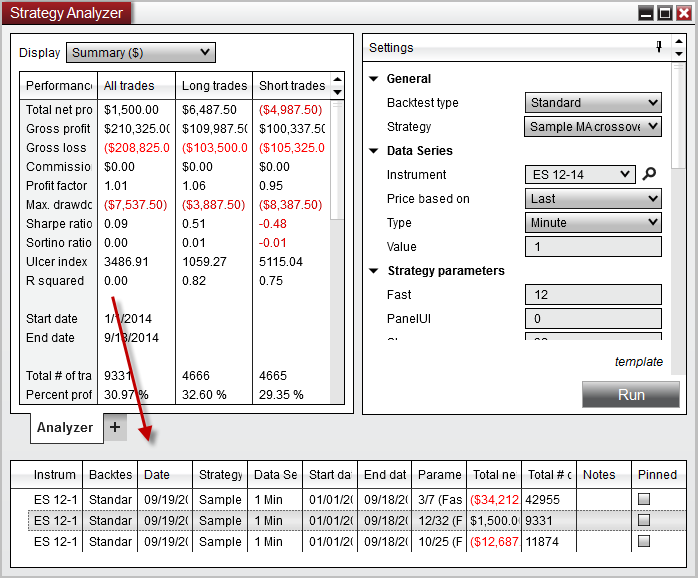 NinjaTrader saves a log each time you perform a backtest in the strategyt analyzer. It saves several key information in the log which makes it easier to iterate on a strategy over time. The instrument the test was performed on. An optional field to add user defined notes to more accurately recall the test. Double click the field to begin editing and when complete press enter on the keyboard to set the note. An optional field to Pin a result to the top. Pinned results are useful for saving a specific backtest of note for reference later. Logs are integrated with the Strategy Analyzer and can be double clicked to quickly restore the parameters and backtest information for that backtest. Giving you freedom to experiment with different configurations while maintaining the ability to compare previous backtests and restore a previous backtest at any time. Removes all backtest logs that are not pinned.